From its bustling downtown to its quiet suburbs, the use of concrete throughout Houston is strong. Two concentric concrete freeways circle downtown around a vibrant assortment of museums, art and cultural institutions, professional teams, event centers, and nightlife. Many of the buildings display architectural uses of concrete such as the battered walls of cast-in-place concrete at the Alley Theatre. Houston's draw as a culturally-stimulating city also attracts some of the most passionate trend-setting designers and contractors. Beyond the gray industrial uses of concrete lies a world of colored and stamped concrete in many of Houston's residences, retail stores, townhomes, and business offices. From sidewalks to pool decks and patios, stamped concrete is a design-savvy choice that meets the requirements of the Bayou City for an economical and long-lasting surface that can suffice any design scheme. Here is a list of concrete contractors in Houston . Ashlar slate, European cobblestone and seamless slate textures are three of the most popular patterns for stamped concrete installed in Houston. The traditional style of homes in Houston are candidates for both ashlar and European cobbles. For those wishing to texture their concrete without the defined characteristics of a pattern, many Houston residents and business owners are turning to seamless slate textures. This style of stamped concrete imparts a texture to the concrete that looks like natural stone. Its seamless quality ensures that there are no visible pattern lines for an expansive and cohesive look. 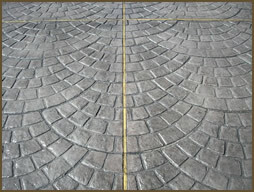 European cobblestone stamp pattern installed on a 2,500 sq. ft. driveway townhome project, Inner Loop, Houston. 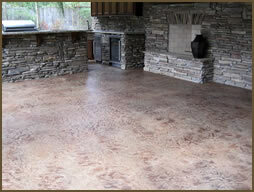 Earth tones are the primary colors chosen for stamped concrete. Because stamped concrete is often used to mimic the look of natural stone, contractors will use a variety of techniques to create one-of-a-kind color schemes. For best results, choose a color that is a natural complement to the style and color of the home or business. Getting the concrete to look natural is a skill that contractors have perfected with different tools and application methods. Each contractor will have their own preference for applying color. As a tip, choose a lighter base color for the primary color of the concrete accented or highlighted by a darker secondary color. This technique is what makes stamped concrete look natural and provides the perception of stone, tile, wood, or rock. Stamping concrete is a permanent product that cannot be easily fixed or replaced if not installed correctly. Hiring an experienced contractor should be first priority as they have the technical skill and know-how to pour, stamp, and color the concrete. Looking at photos of previous work on a contractor's website will provide insights such as if they have done similar jobs, how their coloring looks when it is finished, etc. It's also helpful to visit stamped concrete projects they have installed around the city of Houston if possible to see the final product up close.